Paul Tisdale predicts the race for automatic promotion will go right to the wire after his side lost 2-1 to Tranmere Rovers on Saturday. Goals from David Perkins and Connor Jennings, either side of Kieran Agard's 22nd of the season, ensured Rovers closed the gap to the automatic spots, with now three points separating four teams with four games remaining. 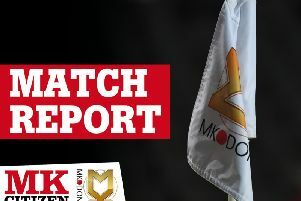 Dons take on Mansfield, who sit third, on the final day of the season at Stadium MK, and Tisdale expects the race to still be running on May 4. "I haven't got a crystal ball but it's quite possible," he said. "Unless you keep winning, it's not easy. "It's not over today, even if we'd have won it wouldn't have made the season either." Suffering their second defeat in as many games to promotion rivals, Dons dropped out of the top three after losing to Tranmere. Barely threatening Scott Davies' goal all afternoon, Tisdale admitted: "It didn't work for us today, but that does not mean I've lost faith in what we can do. "It's disappointing, not what we wanted. We tried hard but didn't have enough of a threat in us today to threaten Tranmere. It was difficult for us but I don't underestimate our chances. Four games to go. "Their second goal changed the game. It was an even game in the first half. I was pleased with the display in difficult conditions – it's very bumpy and very windy. It was very competitive, we stood our ground and competed enough to have a share of the spoils in the first half. We just didn't quite create enough of a threat, and nothing seemed to work in the second period. Their second goal, as obvious as it sounds, changed the game. "They stuck to their shape, they're good at it and we didn't have enough on the pitch to make things happen. It suited them, but I think they looked more likely to score. The space was in our half, not in theirs. "We're desperately disappointed. We are scrapping around for options, but we've got enough talent and enough guile to get results and that's what we have to do. Although we didn't today, I'm proud of the effort they put in. I'm behind the players, the fans are too, but we have four games to go."